What is WiFi: What Does WiFi Mean? How Does WiFi Work? Science Of WiFi: How Does WiFi Work? WiFi is a technology that uses radio waves to send and receive signals from nearby devices to provide Internet access to the devices connected to it. We live in a modern age where staying connected seems like one of the most important aspects of life. Almost every person uses WiFi at some point in their day. Whether we’re updating our social media status, ordering a large pizza, hailing a cab, booking flights or train tickets, and even leveraging it for educational purposes, being online is crucially important! The groundbreaking technology of WiFi has become available to the general public in almost every cafe, restaurant and public space in the world, completely taking the world by storm! For today’s teenagers, a day without food would probably be easier than a day without WiFi. WiFi is a type of technology that enables you to connect to the Internet almost anywhere, on any device, including your computer, smartphone, tablet or audio device, without any need for wires, which is why it’s called wireless connectivity. WiFi is also sometimes referred to as ‘Wireless Local Area Network’ or WLAN, which basically sums up what the technology is all about. In technical terms, WiFi (or wireless networking) is known as IEEE 802.11 technologies. Without getting into too much detail, IEEE 802.11 is a set of standards, created and maintained by the Institute of Electrical and Electronics Engineers, that are used to implement WLAN communication in select frequency bands (Source). 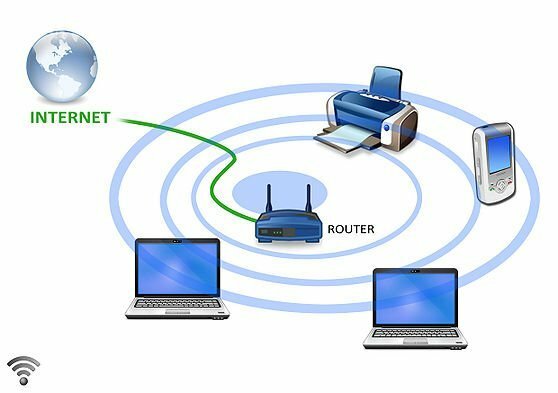 WiFi allows multiple users to connect their electronic devices to a given Internet router at the same time and access the Internet on their respective devices (usually) without any interference/disturbance. For this reason, many restaurants, hotels, train stations, airports and countless other institutions have numerous WiFi routers installed around their premises so that people can access the Internet on the go. 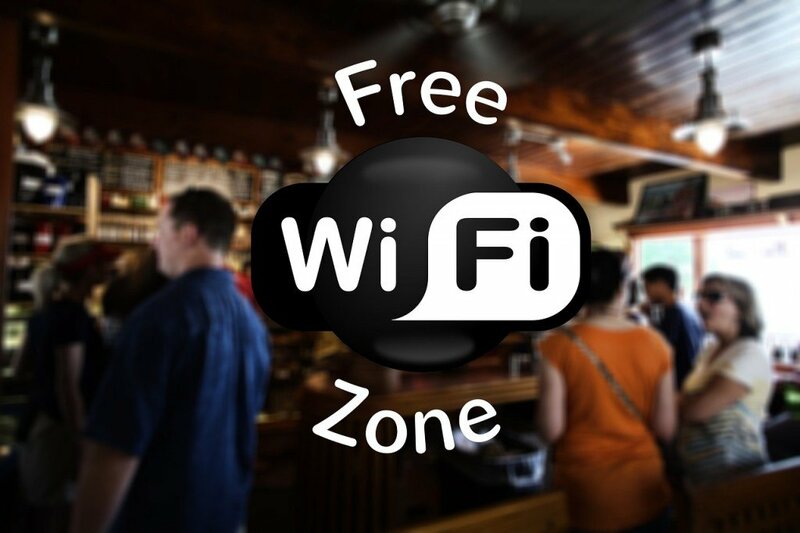 At some places, you may have to pay a fee to connect to a wireless network, but places like restaurants and hotels usually provide free WiFi connectivity. In common usage, the term ‘WiFi’ stands for Wireless Fidelity. The word ‘WiFi’ is actually a brand name that was introduced by a brand consulting firm for the underlying technology, which had a rather complex name. 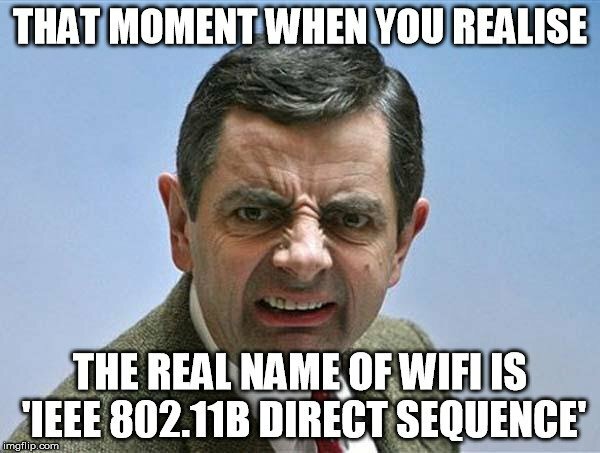 Asking a bartender for the password to the ‘IEEE 802.11b Direct Sequence’ is a bit of a mouthful. Note that ‘WiFi’ is actually a wireless brand owned by the WiFi Alliance, which is a non-profit organization that promotes WiFi technology and WiFi products. Obviously, the WiFi Alliance wanted something more catchy than a name that most regular users wouldn’t ever get a hang of. That’s how the term ‘WiFi’ was coined. One of the founding members of the WiFi Alliance, who presided over the selection of the name ‘WiFi’, said that the word ‘WiFi’ was intended to be a pun on the word ‘hi-fi’ (Source). WiFi relies on the transmission and reception of radio waves, a type of electromagnetic wave (other members of the electromagnetic spectrum include visible light, ultraviolet rays, infrared, X-rays etc. ), in order to communicate between devices. The radio frequencies of WiFi signals are significantly different from those you might find in car radios, cell phones or walkie-talkies, as WiFi frequencies lie in the Gigahertz range. 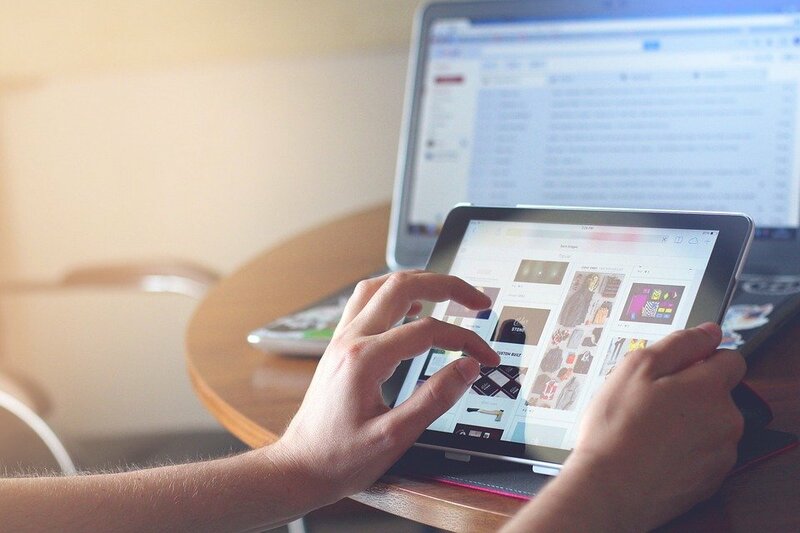 There are two main types of wireless connectivity that can get you connected to the Internet: mobile Internet access through your mobile network provider or a wireless Internet connection through a device called a WiFi router. 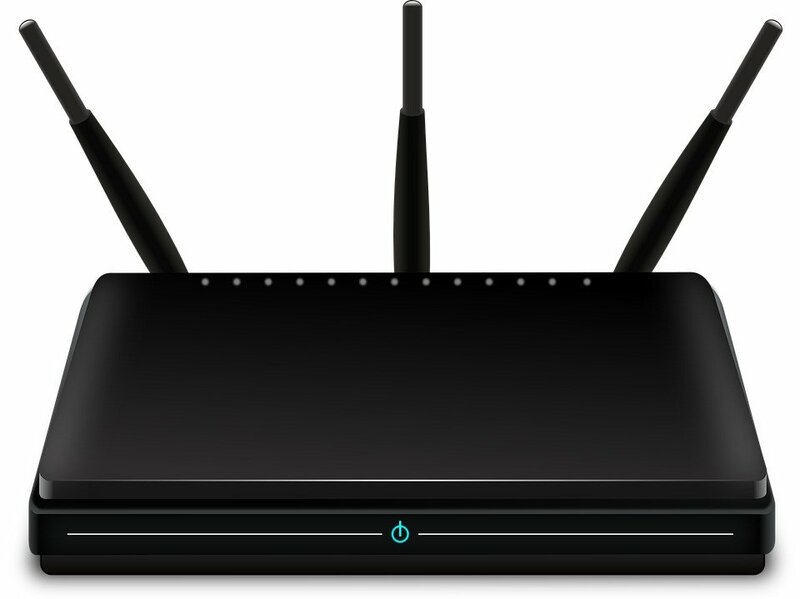 A WiFi router, also referred to as a wireless router, is an electronic networking device that forwards data packets between computer networks, thus providing Internet access to multiple devices connected to it. In simple words, it is a machine that sends ‘Internet’ from a cable to a device, and also acts as a wireless access point, allowing the data it’s getting through a cable to be shared with the connected devices wirelessly. How does a Wifi Router work? A WiFi router first gets the data from a phone/cable line connected to it, converts this data into radio signals, and then transmits them in its range. These signals are detected by nearby devices (e.g., laptop, smartphone etc.) that contain a wireless adapter. This adapter translates the data (that you are trying to send to the Internet) into radio signals through the use of an antenna. The router receives these radio signals (sent by your smartphone), decodes them into data, and then sends that data to the Internet via an Ethernet connection. The same process is repeated in the reverse direction and Voila! Within seconds, you can update your Facebook status! 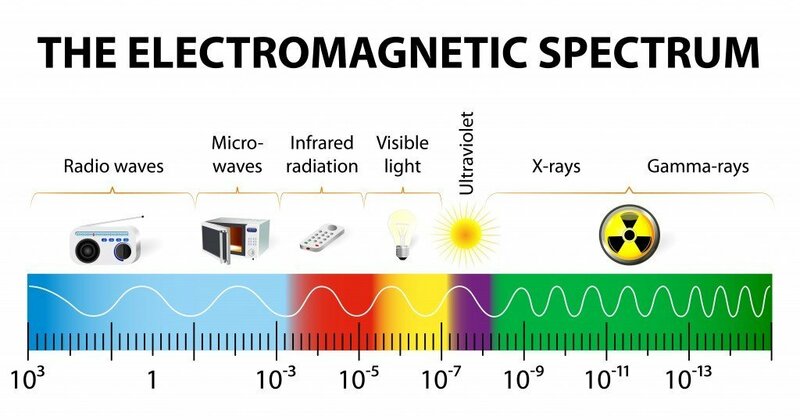 This process may sound like it takes a long time when described like this, but all of this actually takes place within a fraction of a second, thanks to the speed of radio waves, which, like any electromagnetic wave, travel at the speed of light. At least, that’s what the World Health Organization (WHO) says about it. Until we hear otherwise, you can keep watching videos on your tablet using WiFi without adversely affecting your, or anyone else’s, health!